In addition to producing and touring with the theater ensemble The New York Neo-Futurists, the playwright and author tours with live shows for the Night Vale Presents production banner, co-created with Joseph Fink. Night Vale Presents now produces four podcasts that regularly sit at the top of the charts — including Within the Wires, also created by the author — and recently published two volumes of episode transcripts that include extras for fans of their original show. Welcome to Night Vale has been described as “NPR meets The Twilight Zone,” a sci-fi broadcast about a small desert community where strange mythologies abound, and all conspiracy theory is potentially real. Kelton Reid: And welcome back to the Writer Files. I’m still your host, Kelton Reid, here to take you on yet another tour of the habits, habitats, and brains of renowned scribes. In part two of this file, the co-creator and co-writer of the number one international hit podcast, Welcome to Night Vale, and New York Times best selling co-author of the novel of the same name, Jeffrey Cranor, returned to talk to me about the importance of collaboration, deadlines, and bad writing. In addition to producing and touring with the theater ensemble, The New York Neo-Futurists, the playwright and author tours with live shows for the Night Vale Presents production banner, co-created with Joseph Fink. Night Vale Presents now produces four podcasts that sit atop the charts, including Within the Wires, also created by the author. They’ve recently published two volumes of episode transcripts that include extras for fans of their original show. Welcome to Night Vale has been described as NPR meets The Twilight Zone, a sci-fi broadcast about a small desert community where strange mythologies abound and all conspiracy theory is potentially real. In part two of this file, Jeffrey and I discuss the power of productive procrastination, how making the familiar strange produces great writing, why it’s really hard to be good all the time, how the battle against expectation can surprise readers, and the art of great audio books as performance. If you’re a fan of the Writer Files, please click subscribe to automatically see new interviews as soon as they’re published. If you missed the first half of this show, you can find it in the archives on iTunes, on WriterFiles.FM, and in the show notes . This episode of The Writer Files is brought to you by Audible. I’ll have more on their special offer later in the show, but if you love audiobooks or you’ve always wanted to give them a try, you can check out over 180,000 titles right now at Audibletrial.com/Rainmaker. Kelton Reid: That’s cool, I like that. Do you lean into procrastination or do you kind of have some tricks for beating it? Jeffrey Cranor: Oh, I definitely lean into procrastination. I’m really bad at procrastination. I think the number one thing that helps me with procrastination is allowing myself to put something off, as long as I am doing something else productive in its stead. I think that if I find myself, I don’t know, spending too long, just like, “Oh, you know what? I’m just going to hang out and play a game while listening to a podcast,” or something, like really unproductive things. Not that those are bad for you, but over too much time, they do become unproductive because they’re taking away from writing time or actual work. But I think there’s always some business to be done as a writer. For Joseph and me doing Night Vale Presents, there’s a lot. It’s a business, right? So we do have to respond to emails, and do make decisions, and go back and forth. A lot of times I’ll take some time away from writing to just get myself in front of a computer, do those little things. Return some emails, check everything, play the game of, “Can I get to inbox zero?” Stuff like that. Kelton Reid: Yeah, and your brain likes those little victories, doesn’t it? I think Austin Kleon, and I’m sure lots of other people, call it productive procrastination, where you’re just switching modes so your brain can focus on something else in the background, do that incubation stuff that it likes so much. Cool, man. I’d love to pick your brain a little bit about creativity if you’ve got some more time. Kelton Reid: How do you define creativity in your own words? Jeffrey Cranor: I think it’s just, for me, it’s about original expression. Creativity is, I guess, a combination of finding your own voice within the confines of everything else that helped to shape it. So I think, for me, creativity is walking that balance of creating an original thing, something that is all yours, but using all of the tools and all of the components and tropes and devices that have come before. It is kind of like recycling, in some ways. You’re taking old soda bottles and melting them down and repacking them as something else. I think you can’t be truly creative without having consumed a lot of other art in the past. You have to have a lot of that experience and know how to make a certain thing. But there’s always a part of you that is truly unique and original. Everybody grows up differently. We may have a lot of similar experiences, but everybody has their own unique take on the world. Creativity, to me, is taking your standard mystery novel or your standard sitcom, or whatever your real, like … set structure, and then adding your own unique viewpoint inside of that whenever you write that yourself. I think, to me, it’s building out structures that are familiar, and then finding a new way to present them that the people haven’t done before. Kelton Reid: Yeah, yeah. You definitely do that with Welcome to Night Vale, and I’ve heard it described as NPR meets The Twilight Zone. It definitely has that. Has anyone ever used the adjective phantasmagoric? Jeffrey Cranor: I don’t know. Jeffrey Cranor: Yeah, that’s good. Kelton Reid: I want to be the first. Kelton Reid: I don’t know why it came to mind, but it’s got those elements of the Theater of the Absurd meets kind of like X-Files, and then procedural, and then beautiful, small-town NPR stuff, which is all just an amazing remix of stuff we know, but it’s so different. It’s truly brilliant. Sorry to digress there back to that. When do you think you feel the most creative? It is a little tough. I think usually the feeling itself of feeling creative usually happens about half an hour to an hour into working on something. It usually, if I feel myself on a roll … A couple days ago I really cranked through like 6,000 words, and I did it over a course of a long stretch of an afternoon. I just felt, “Man, I’m really, really working through this. This is flowing really, really well. Man, I just had a really good joke to insert into this paragraph,” and, “Oh, this really feels good.” A lot of it is just getting into a rhythm, and if I can get myself into the rhythm, I’m feeling very creative. Now, whether or not that stuff is any good I’ll know a few days later when I go look at it again. Kelton Reid: I think sci-fi author Andy Weir had a very similar thought on it, and it was just that he looks back on these … He just makes sure that he writes it. He doesn’t always feel awesome when he’s writing it, but looking back, it didn’t matter. That those things were equally as important to the process. That’s cool. Do you have a creative muse at the moment? I think for me, my muse is mostly just having a positive environment. It’s very hard for me to write when I am traveling. We tour a lot for Welcome to Night Vale. In tour times, Joseph and I have gotten to the point now where, we have written things on tour, but on tour we’ve learned to not pretend like we’re going to get anything done when we’re traveling. Because when you’re on an airplane, airplanes are inherently uncomfortable and stressful. It’s hard to sit and write in that little tiny cramped seat where somebody leans back into your lap. Hotel rooms, equally so. Especially when what you’re doing is touring, so you arrive at a hotel at three in the afternoon. You have an hour and a half before you then have to go the theater and do soundcheck. Then you’re backstage at a theater, and while you’re not on stage the whole time, you’re just around a bunch of people and eventually you’re going to have to pack everything up, Maybe go out and meet fans. By eleven o’clock that night you’re like, “Well, I got to go to sleep and get up at nine in the morning and do this all over again.” It’s really hard to find that time to be like, “I have this really relaxing positive environment to really focus.” Yeah, so my muse is quiet and peace. Kelton Reid: Nice, nice. What do you think, in your estimation, makes a writer great? Jeffrey Cranor: Doing it a lot. I think more than anything else, that’s it. I remember reading … Oh, God, I’m going to forget the name of it … Steve Martin’s last book, basically his memoir about his stand-up career. He has some moment in it where he talked about doing stand-up comedy, and he didn’t do it for very long and he was great at it. But he did talk about the idea of greatness. He says if you’re naturally inclined to comedy and you’re really good at it, you will find that it becomes easy to be great. What’s really hard is being good all the time, because in doing your stand-up act, you can’t just be great and have a great show and then the next night be okay. Everybody there needs to laugh. That’s the whole point of your job. So you need to find a way to be good all the time. I think that comes from constant experience. In fact, when I’ve gone to see stand-up comedy … I remember going one night to the Comedy Cellar in New York City, and I remember the night that I was there there was some really great comedians. Aziz Ansari performed, and Amy Schumer performed that night. This was a couple years ago. They were great. I really love them. They’re super funny. But I remember at the end of the night, the last comedian was a guy named Allan Havey, who I’ve never seen in person before but I knew who he was. He’s in his 50’s, if not 60. He’s been at it since I was a kid. I remember him on Short Attention Span Theater and Comedy Central when I was in High School. He was amazing! I think what made him amazing wasn’t the jokes, because if you’re going to ask comedians of that night to write down their jokes, I’m probably gravitating towards Aziz Ansari and Amy Schumer, and just the quality of the craftsmanship of the joke. But what made Allan Havey great is that he could tell you any joke and it would have been brilliant, because he knew how to work the crowd. He was doing a full-on performance. I think that’s the sign of a really, really great comedian that can do that night after night, no matter the crowd that he’s in. He knows what people are saying and what people are doing, and how to use their energy back at them. I think with a writer, while it’s not performative, I think being able to write all the time and publish as much as you can, even if it’s just a blog, even if it’s just jokes on Twitter, just getting something out there and constantly making a thing is really, really vital. I think when you do that a lot, you get really, really good at it. Even if you’re not making best selling hits, right? Even if you’re not creating the next Gone Girl, or Between the World and Me, or something. You are still creating great things that people will truly enjoy reading. Kelton Reid: Those authors wrote some bad stuff at the beginning. All writers do. Kelton Reid: To start out, it’s that iterative process. You got to ship to know what you’re dealing with and forge that. Jeffrey Cranor: It’s a very hard career to come at late. I mean, most careers are hard to come at late, but it’s not one you can easily fake. It’s like weight lifting. You can’t just suddenly be an offensive linemen. You really have to work for years and years to do that. Jeffrey Cranor: Nope! And sometimes, even if it’s a very first novel they’ve ever written, which there’s a lot of people who, in their first novel, have a huge success with it, but I would also counter that, yeah, just like you said, they’ve probably done a lot of other things prior to that. In addition to that, I bet that novel took a lot of iterations to get right. Jeffrey Cranor: There’s just a lot that goes into it. Kelton Reid: So many novels start with a short story, or just an idea, and obviously become … take on a life of their own. We will be right back after a very short break. Thanks so much for listening to The Writer Files. Kelton Reid: Do you have a couple favorite authors sitting on your nightstand, or playing in your headphones? Jeffrey Cranor: Let me try to answer that. I’m going to turn to my left and look at my shelf. I do. One of my favorite authors is a playwright named Will Eno. I love Will Eno’s work, and I feel like, when we write and when we first start really getting into writing, or a style of writing, we like to emulate other writers, and Will Eno’s a person I think I’ve always wanted to emulate. He writes plays, he writes dialog plays, but he also has a whole bunch of monologue pieces. The first of those that I read was a play called Thom Pain (based on nothing), and it is a solo performance. It was originally performed in New York by the actor James Urbaniak, who’s been on Welcome to Night Vale since, which is really exciting for me. Will Eno’s work has this ability to be, when you look at it on a page, it’s very simple. The writing structure is simple, but it’s deeply poetic, and very introverted, and it uses the audience really, really well. He’s very confrontational without saying controversial things. There’s some of that in there, but mostly he just always, always makes the audience battle against expectations. He does some really fascinating things with his writing in Thom Pain. There’s a moment when he asks a member of the audience to come up on stage, “I need you for something. Just stand right there.” Then proceeds to continue out the rest of the show without ever using them. So just leaves the person on stage throughout the rest of the show without anything to do, always expecting something about to happen. It’s kind of, you’re used to the improv comedian or the magician needing a volunteer to come up and do a thing, and then you find yourself never used again, and it becomes this really amazing thing for the rest of the audience to watch that happen. Another writer I really, really love is Helen DeWitt. She wrote one of my favorite books of all time, called The Last Samurai. Do you know this book? Kelton Reid: I do, yeah. It’s one I found when I was in creative writing school, and I think it had a limited release, right? Then it went out of print and then it came back. They republished it recently. Jeffrey Cranor: Oh, it might have. I have no idea. I bought it way back in 2003, I think. But yeah, I didn’t know if it went out of print or not. I found out after I read it back then that it was big, hot stuff in the literary world. As in like, here’s a first time novelist and here’s this brilliant novel. All these publishers really want it. And it took her a long, long time to write a second book. Last Samurai, I thought, was so beautiful and immersive. I think it does a similar thing to what Will Eno does, which is to create a fairly simple vocabulary, a fairly simple language. Describing things in not lavish detail, but in enough detail to allow you as the reader, or the viewer in the case of Will, to build out your own world. Some of the really heartfelt moments, or the really scary moments in both of those writers’ work is what they’re not telling you, and what they’re not revealing. Anyways, but yeah, I felt Last Samurai was absolutely beautiful and stunning. Jeffrey Cranor: I just read last year, for the first time, If On A Winter’s Night A Traveler by Italo Calvino. It was brilliant. I’ve never read Calvino’s work and I finally got around to reading it, so I can’t claim him as a favorite author, but that was one of the best things I’ve ever read, and it’s tremendous. So welcome to me finally discovering Italo in 2015. Kelton Reid: Yeah, Calvino’s fantastic. And so is Helen DeWitt, and I look forward to checking out the other author you mentioned. Do you have a favorite quote? A lot of writers have a quote just kind of floating over their desk somewhere, or memorized. Do you have one you want to share with writers? Jeffrey Cranor: I do. I guess people still do this with email. I don’t know if you do this with your email or anything. I don’t really notice signatures on email anymore because Gmail usually truncates that stuff, but back in the day people kind of devised a personalized signature at the bottom of their emails and a lot of times it would be a quote. Especially all of my writer and theater friends would have a quote from somebody at the bottom. My friend Joey Rizzolo, who was a member of The New York Neo-Futurists theater company, had a quote at the bottom of his. So when you’d get an email from Joey Rizzolo you’d have the email, and he’d just put ‘Joey,’ and then at the bottom, it would have this quote. The quote said, “We’re writers. Why are we always quoting some other writer? We’re writers, after all. -Joey Rizzolo.” That’s my favorite quote. Kelton Reid: I hope Joey hears this and takes a bow. Jeffrey Cranor: It’s tremendous, and it was so good I wanted to steal it and knew that I couldn’t, and that made me sad. Kelton Reid: Love it. It’s too meta, so I’m going to have to steal it and put it over my desk now. Kelton Reid: I know we need to wrap here pretty quick. I got a couple fun ones for you. I have this question; do you prefer paper or eBook? I guess I should add, or audiobook? Do you have a preference? Jeffrey Cranor: I love audiobooks. I’ve always loved radio. I’ve always loved listening to things. I hope that’s not heretical to say, but I love audiobooks. There’s a real distinct art to them. I’m much more willing to give up on an audiobook then I am on a printed book, because a printed book, it’s all your fault if you can’t get it right. Whereas the audiobook, sometimes they just don’t translate well for me. Sometimes the performance is just not quite there, or the book doesn’t work as an audiobook. I think, guaranteed, getting a good quality is going to be much better in a book book than in an audiobook, because there’s just so many other moving parts to audiobooks. I just love them. It’s so great when you find great narrators, like Robertson Dean, or George Guidall. There are just so many really good narrators out there that do a fantastic job. Definitely prefer a printed book over an eBook, just because it’s more lasting. It feels more memorable to me. There’s the physical weight and the touch of the pages. I don’t even think I’m being romantic when I say that, I think that’s just physiology. I just think your body is more likely to hold on to information that’s tangible, that you’ve actually touched. That being said, I’m not opposed to eBooks. I travel a lot, so I definitely have to go eBook quite a bit. That’s fine. They’re great. They’re super excellent for travelling, because I don’t have to have five pounds of books in my bag. Kelton Reid: Yeah, yeah. Hybrid medium is the message. Jeffrey Cranor: Add Marshall McLuhan to my list of people I really love as writers. Kelton Reid: Oh, yeah. The Medium is the Massage. Jeffrey Cranor: Yes. I have that book, too. It’s great. Kelton Reid: My mom recently gave me a vintage copy of that, and I was like, “I think they spelled it wrong. Oh wait, that was intentional.” All right, if you could choose one author from any era for an all-expense paid dinner to your favorite spot in the world, who would you choose and where would you take them? Jeffrey Cranor: That’s a great question. I feel like I might … I would one of two things. Partially, there’s a person like Will Eno that I just mentioned a little bit ago, who’s living, not that far from my own age, maybe we’re ten years apart. That’s somebody that I just think, professionally, I would just love to meet, because he’s had such a profound influence on my life. That being said, I don’t know how comfortable I am with meeting people I’m a big fan of. There’s a lot of people I enjoy meeting that I really appreciate their work, but sometimes when you reach the level of “I’m a fan of you,” you just can’t not have shake-voice when you do actually meet them. So I feel like maybe that would be counterproductive. I would be really interested in someone like Jane Austen, if only for the fact of, you have a person who managed to write quite a bit given the time-frame she wrote in, but did not write for a very long time. I think I’m always curious about the level of writing that she was at, which was, we’re talking the upper echelon of Western writers. She was absolutely brilliant. And of that era, there’s so little known. There’s a lot know, but there’s so much that’s been repressed about women’s histories in the history of humankind, and I think that we’re missing so much of her story because we didn’t canonize women the same way we did men. Like, any average man from then. Some just spare Earl or Viscount gets pages in an encyclopedia, and there’s so many women who did not. I think we’re missing a lot of her life, and I would be very interested to know more about her, and more about her writing process, and about who she was during that era. Kelton Reid: Interesting. And where would you go for dinner? Jeffrey Cranor: That’s a great question. Oh, man, there’s a really great restaurant and brewery in Athens, New York, called Crossroads that I really, really enjoy. They always have really excellent stuff, so maybe we’ll go there. My knowledge of restaurants in England is much more limited. Kelton Reid: I skipped over one earlier, but maybe before we get to your writing advice for fellow scribes, you could tell us how Jeffrey Cranor unwinds at the end of a long writing day.? Jeffrey Cranor: I’ll tell you what I did last night after the end of a long writing day, which was, my wife Jillian had gone to the store and got some food, and I finished up right around the time she got home and started making dinner, so I went upstairs and helped make dinner. Chopped up some peppers, and grated some cheese, and made some bread. We poured some wine and had a go at making a flourless chocolate cake, which we hadn’t tried before. I think we over baked it a little bit, but for the most part came out really tasty. It wasn’t super dense, which was really great, if only slightly dry on top. That was a problem. But yeah, cooking and having wine, or a bourbon, something like that. I can’t do that every night, make a flourless chocolate cake and throw back a bunch of wine, stuff like that. I think cooking, having an evening to just cook and have nice food, and things like that, is one of my favorite things to do to unwind. Kelton Reid: Well, to wrap it up here, do you have some advice for your fellow writers on how to keep the ink flowing and cursor moving? Jeffrey Cranor: I think you have to make opportunities for yourself. Self publish, self produce whenever you can. Always give yourself a reason to have to make a thing. Not just you want to make a thing, but make a path that you have to make a thing. If you have a blog, tell people that you put out a new post every 48 hours. At noon every other day, or at Mondays, Wednesdays, and Fridays at three PM, you will have a brand new post about this subject. Make those paths for yourself. Make yourself have to make a thing. When you do that, you feel like you are indebted to more than just yourself. I think that’s the number one thing. Kelton Reid: Lock, stock, and barrel with Jeffrey Cranor, best-selling author, co-creator Welcome to Night Vale and Night Vale Presents worlds. Lots of stuff going on to find out there. Is the best way to connect with that world at welcometonightvale.com? Jeffrey Cranor: I think that’s the best way. Also, we put a lot of updates on our Facebook page and Twitter account, too. Look for all that there. Kelton Reid: I will link to all of those in the show notes. Congrats on the new show Within the Wires, which is fantastic. You can find those wherever fine podcasts are consumed. Does that sound awful? Jeffrey Cranor: That’s great. Wherever you get podcasts. iTunes, Stitcher, or wherever. Kelton Reid: Yeah, absolutely. There’s so much out there to find. What’s your next stop in the live show, the tour? What’s next for you? Jeffrey Cranor: We just started a Europe tour. We’re two shows in. I’m not on that tour yet, but they just did a show in Paris on Monday night and a show in Madrid last night. Tomorrow night they’ll be in Cologne and going on over to Stockholm, Oslo, Copenhagen, Amsterdam, Berlin, Munich, Prague, Warsaw, and then I’m going to join up on October 20th in Dublin. We’re going to go to Dublin, Brighton, London, and Manchester to close out the month. Jeffrey Cranor: It’s really exciting. Kelton Reid: Seems like you have fans all over the world, and congratulations on all of your successes. I really appreciate you chatting with us about your process. Feel free to come back any time. Jeffrey Cranor: Thanks so much, Kelton. Kelton Reid: Thank you so much for joining me for this half of a tour through the writer’s process. 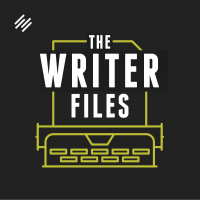 If you enjoy The Writer Files podcast, please subscribe to the show and leave us a rating or a review on iTunes to help other writers find us. For more episodes, or to just leave a comment or a question, you can drop by WriterFiles.FM. You can always chat with me on Twitter @KeltonReid. Cheers. Talk to you next week. xd it’s definitely like weight-lifting. That ‘OverNight success’ People talk about isn’t real. By emulating a mentor I’ve come to find that this people make series of errors just like everybody else. Which, they tend not to talk about.